LEARNING the Spanish way will be top of the agenda this weekend as Irish coaches travel in bulk to Salou for the DB Sports Tours Futbol Salou inspection visit. In recent weeks the Irish Daily Star’s Target has been previewing the exciting trip to Catalunya – and we have one final surprise for the travelling group. The EIGHT lucky winners of our competition with the Irish Daily Star to join the tour have been decided and one more exciting destination has been added to the itinerary. Joseph Gannon (Swords), Mark Doyle (Ballybrack), Darragh McCallion (Raheny), Gary Grogan (Navan), Alan O’Brien (Navan), Wayne Christie (Finglas), Raymond Purdue (Clondalkin) and Tony Livingston (Cabinteely) will travel from Friday to Sunday as competition winners. Along with the rest of the group, they will sample the impressive facilities at Futbol Salou’s sporting complex on Friday and take in a masterclass training session from Technical Director Albert Vinas. Recently appointed the Director of Coach Education for Libya, Vinas tutored former Barcelona Head Coach Tito Vilanova and Liverpool Head Academy coach Rodolfo Borrell when working with the Catalan Futbol Federation. The following day the group will travel to Barcelona, where they will gain access to the prestigious academy of La Liga side RCD Espanyol for the morning. 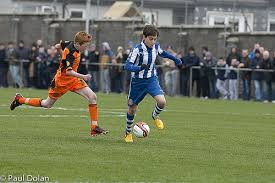 Local rivals of the world-famous FC Barcelona, Espanyol pride themselves on developing young talent also and earlier this year their Under-14 side traveled to Dublin for the St Kevin’s Boys Easter Cup. The Spaniards stole the show (pictured above) with their style of play when competing against the likes of Celtic, Arsenal, West Brom and Kevin’s, so there should be plenty for the traveling Irish coaches to learn on Saturday.